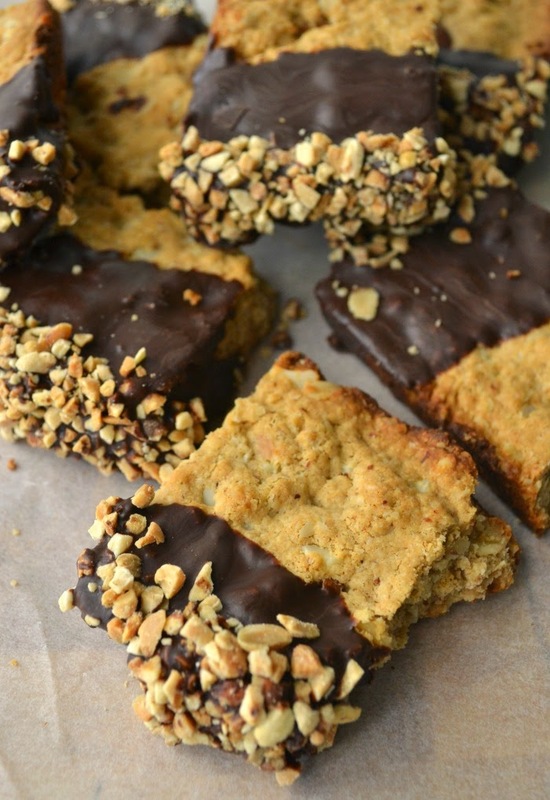 the nOATbook: Choc 'n' Nut Protein Bars - and a Well Naturally giveaway! 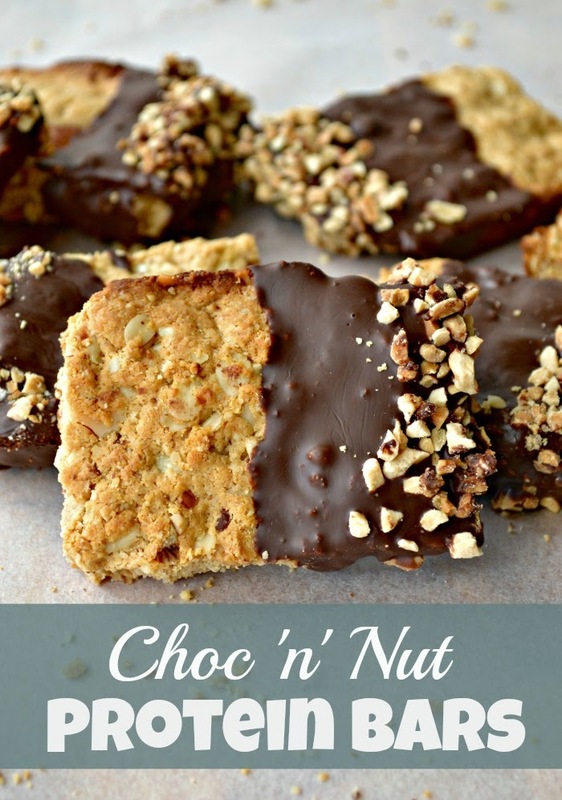 Choc 'n' Nut Protein Bars - and a Well Naturally giveaway! So this post has the full bag - a review, a giveaway and a brand new sugar-free recipe for Choc 'n' Nut Protein Bars. 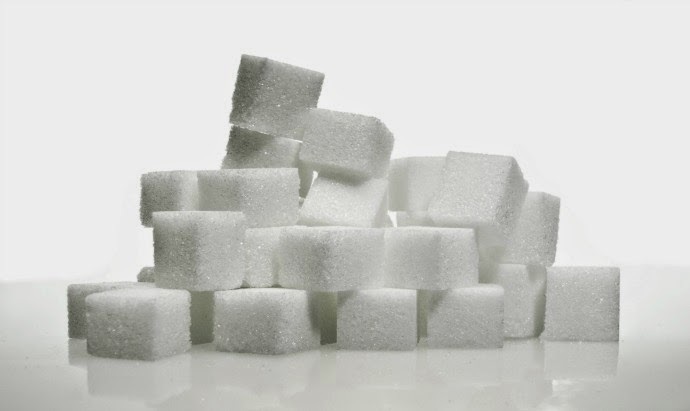 Did you know that on average, Australians consume approximately 54 kilograms of sugar per year? That's the equivalent of 37 teaspoons per person, per day and yet the World Health Organisation recommends that we should only consume around six teaspoons a day! I try to limit the amount of refined sugar in my diet. I like to aim for 1 or 2 completely sugar free days during the week and I try to limit my intake on other days - some days more successfully than others! I also love to adapt baking recipes to make them healthier and this often involves using sugar substitutes such as rice malt syrup or stevia. How much sugar do you eat every day? However if you follow my blog or have checked out my recipe page you will also know that I love chocolate. I use it in a lot in my baking and eating dark chocolate is a fairly regular part of my diet. 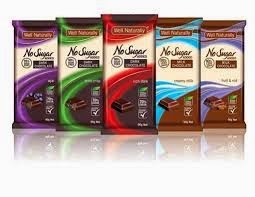 So when I had the opportunity to review the Well Naturally No Added Sugar Chocolate Range, I thought it was a good fit for what I do here on the nOATbook. I could have my chocolate and keep it sugar free too! Well Naturally has a line of better-for-you snack foods including No Added Sugar Milk and Dark chocolate and Cooking Melts. The 90g blocks are available in Dark Chocolate: in Mint Crisp, Rich Dark and Acai varieties; and Milk Chocolate: in Creamy Milk and Fruit & Nut varieties. The No Sugar Added Chocolate is naturally sweetened with stevia, not sugar. Stevia is a plant-based ingredient which has zero calories and no impact on blood sugar levels. Stevia is around 250 times sweeter than sugar, so only a tiny amount is needed to produce the same level of sweetness. So we thought what better way to review the chocolate than completing a blind taste test to compare the No Added Sugar Milk Chocolate to the milk chocolate we had in the cupboard. While it was fairly easy to identify which chocolate was which, it wasn't because one was better than the other. Rather it was a case of one being more familiar than the other. I actually preferred the No Added Sugar chocolate as it had a richer cocoa taste and is more similar in taste to dark chocolate which is my usual chocolate preference. My hubby's favourite was the Fruit and Nut variety and MJ gave a big thumbs up to both the Milk Chocolate and Fruit and Nut variety. He very much enjoyed tasting a new variety each night and giving his expert critique! The Mint Crisp is very similar to the old-school Peppermint Crisp and you only need to eat a little to satisfy a craving. It would also work really well as a topping on a dessert, ice-cream or on a cupcake. However my favourite flavour, and the first block to be finished off, was the Dark Chocolate Acai. I loved how the sweet chewy acai bits are complemented by the rich dark chocolate. The flavour actually reminded me of my chocolate covered blueberries. As far as nutritional stats go the Well Naturally No Added Sugar Milk Chocolate is lower in kilojoules, about 400kJ less per 100g compared to the standard milk chocolate. It is obviously way, way lower in sugar with only 9.1g of sugar per 100g compared to 51.4g per 100g. How much better is that?! The No Added Sugar blocks do contain polydextrose so if you are in the David Gillespie/I Quit Sugar they don't qualify as being sugar-free. My favourite part about the Well Natural range is that I could enjoy some chocolate without releasing my inner sugar monster. Usually when I eat even the smallest hint of sugar it sets off a trigger for me to crazily seek out even more sugar. And while I struggle with the suggested serve size of 13g (a standard serve of chocolate from other brands is 25g so my full respect if you are someone who is satisfied with just three small squares!) I was definitely satisfied with less chocolate than usual and I didn't crave more once I had finished. Well Naturally is available at Woolworths and health food shops. Check out the Well Naturally website http://www.vitalitybrands.com/well-naturally for further information. And now for my first ever blog giveaway! I have 2 x Well Naturally packs worth $35 each to giveaway. All you have to do is answer the question “Which Well Naturally No Sugar Added family block flavour would you pick and why?” in the comments below. The competition will be open for one week for Australian residents and I will select a winner and notify them via email on Thursday 6th November. But we aren't stopping there. 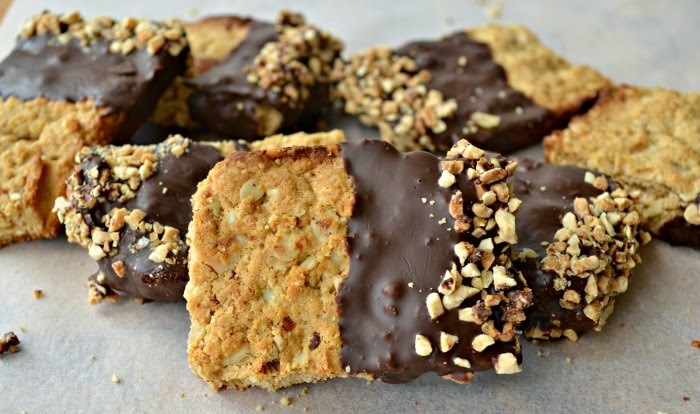 I also wanted to use the No Added Chocolate Melts and I decided to create a sugar and gluten free protein bar. This is the perfect snack to keep you full and satisfied as it is full of protein. Pack one for afternoon tea or for after the gym and you'll be set until dinner. Pre-heat oven to 170 degrees. Line a 20 x 15cm slice tray with baking paper. Combine oat flour, protein powder, walnuts, almonds and salt in a bowl. Place coconut oil, rice malt syrup and peanut butter in a glass jug and heat in 30 second blocks in the microwave until melted. Allow to cool slightly before adding egg and milk and thoroughly combine. Add wet ingredients to dry ingredients. Pour mixture into prepared tray and bake for 15 minutes or until golden brown. Allow to cool in pan before turning out onto wire rack. Allow to cool completely before cutting up into bars. Melt coconut oil and chocolate melts in the microwave. 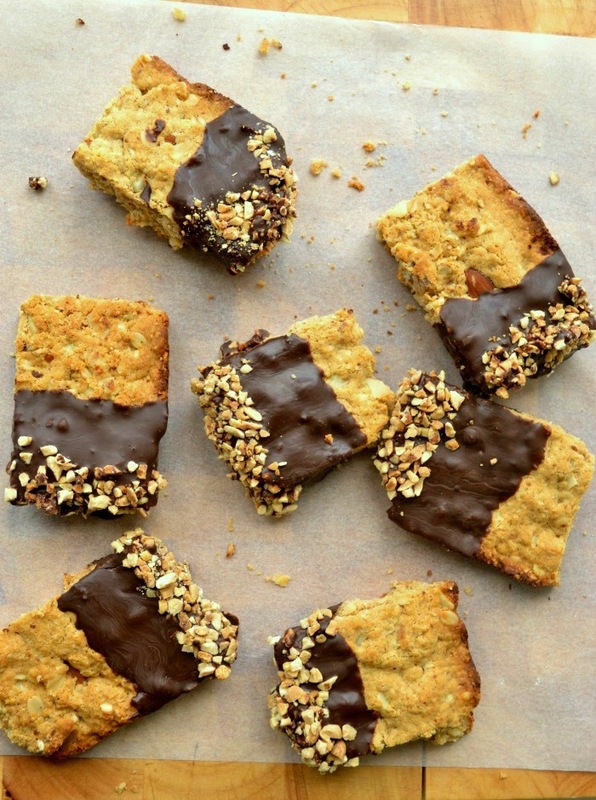 Dip one half of each bar in the chocolate and then immediately dip into the crushed peanuts. Place on a piece of baking paper to allow to set. I was provided with the Well Naturally Product to review however I was not compensated for my time and all opinions expressed are my own. Definitely mint crisp. I miss my peppermint crisp as they are not gluten free. What a fantastic idea!! 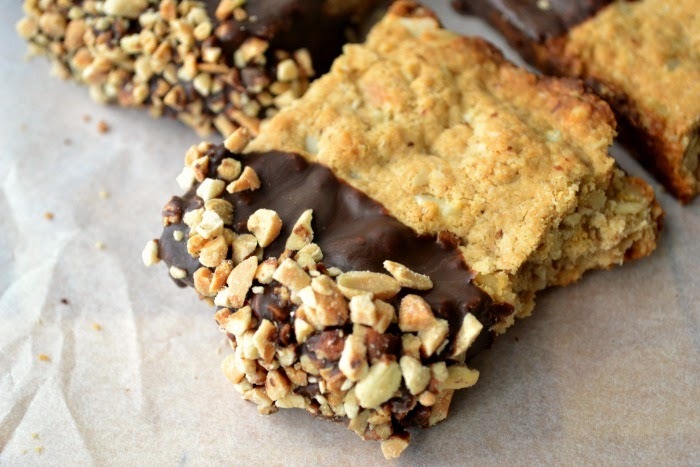 I love the sound of those protein bars and dipping them in chocolate is just inspired!! I would definitely choose the Dark Chocolate Mint Crisp block because I love the flavour of mint and chocolate and it just might be enough to stop me from eating a huge choc-mint choc-top at the movies instead!!! Rich and delicious, it sounds good as can be! My favourite would not be a block but the Dark Chocolate Melts because I’d love to make healthier banana and choc chip muffins for my kids... and being so healthy I might even have one (or two) myself. I would really like to try the Rich Dark Chocolate Acai kind!